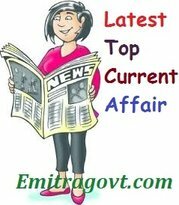 Current Affairs Question 2017: Looking for 4st August Current Affairs? Then start your Quiz right now by answering them. Here in this article, we are giving the Current Affairs Quiz with Questions and Answers. As many people are preparing for various government exams it became mandatory for them to get a grip over the current affairs as in most of the tests are based on Daily Current Affairs. By taking this kind of Current Affairs Quiz candidates can eventually get hold of what they have been working on. Contenders can trust us as we will update all the latest Current Affairs in this quiz. For more such quizzes check our site Emitragovt.com regularly as we will update the Daily Quiz for current affairs. 1. Reserve Bank of India have slashed Repo rate by 25 bps to 6% and Reverse Repo rate adjusted to 5.75% in its third bi-monthly monetary policy. 2. India and Russia have signed contracts for priority design works and supply of main equipment for units 5 and 6 of the Kudankulam nuclear power plant in Tamil Nadu. 3. The government launched a portal, ‘e-RaKAM’, to provide a platform to sell agricultural produce. The portal is a joint initiative by state-run-auctioneer MSTC and Central Warehousing Corporation arm CRWC. 4. Market regulator Sebi has approved the appointment of Dhirendra Swarup as the new chairman of Bombay Stock Exchange (BSE). 5. Former Union Minister Santosh Mohan Dev died. He was 83. 6. Shahid Khaqan Abbasi has been elected as the 18th Prime Minister of Pakistan by country’s National Assembly. 7. Sanjaya Baru, who was media advisor to former Prime Minister Manmohan Singh, has been appointed new secretary general of the Federation of Indian Chambers of Commerce and Industry (FICCI). 8. The additional chief secretary of Rural Development department of Jharkhand, N N Sinha, will be the new managing director National Highway Infrastructure Development Corporation Limited (NHIDCL). 9. Famous American playwright, Sam Shepard died. He was 73. Sam was also famous as an actor, screenwriter and director. 10. Airtel Payments Bank, India’s first payments bank has announced a strategic partnership with Hindustan Petroleum Corporation Limited (HPCL) for ATM services.